It was an anything-goes dinner night here…I think we ate too much guac & chips after swimming that afternoon to warrant wanting dinner. I wanted something. But what? I ended up tossing together a really quick salad and it was just such a reminder that the simplest salads can be the best…either that or the salads with all the stuff. Chop, dress, toss, and enjoy! Make your own honey mustard…it’ll take 2 seconds and you can make just enough for this or you can have it around for your next salad. Peaches will work, if you can stand the fuzz. I cannot so I’ll stick with my nectarines. #thankyouverymuch I loved the combos here. I made my honey mustard heavy on the mustard so it had quite a zing! The lettuce was from the farmers market, the feta was leftover from a Greek-ish salad and the cuke was from our garden. It was perfect. A restaurant would charge $18 for this guy. I threw it together on a whim and it was everything I wanted. 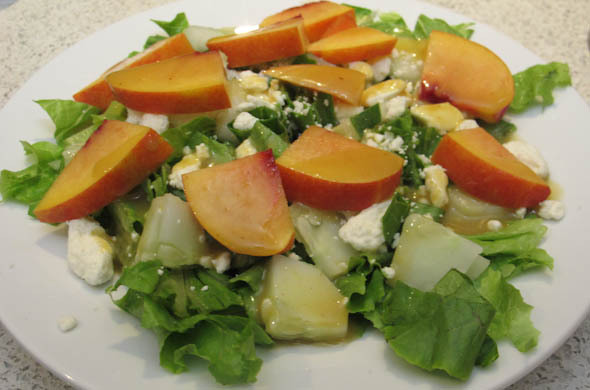 Sweet (nectarine), tangy (honey mustard), salty (feta), and crunchy (cucumbers). I love adding fruit to my salads. Always so good!